Cosa Buona is one of the most talked about restaurants openings in LA this summer. 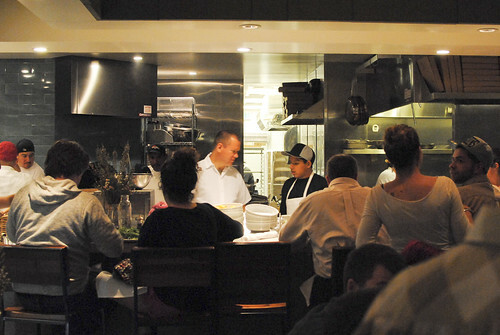 The restaurant is from Zach Pollack, who first opened Sotto with co-chef Steve Samson then opened Alimento. 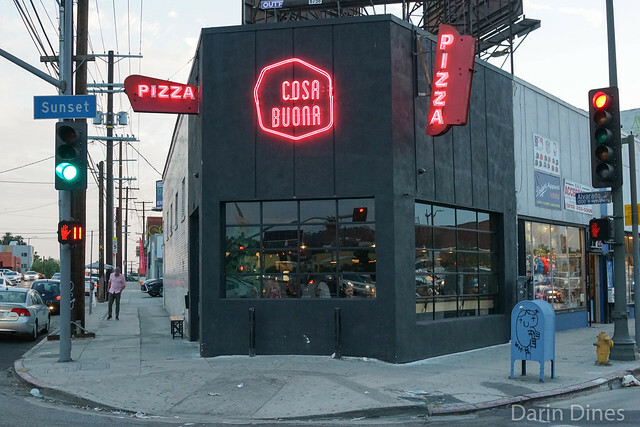 Cosa Buona is the most casual and simple of his restaurants so far, meant to be a neighborhood pizza joint. In fact, the restaurant replaces a similarly-named pizza joint (Pizza Buona) which had been at this location for over 50 years. 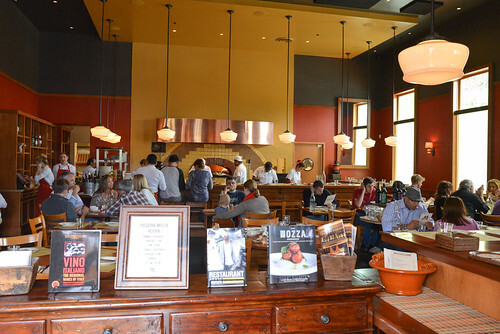 The restaurant takes reservations for parties of four or more; otherwise, it’s walk-in only. Our party of two came early on a Friday to avoid waiting for a table. 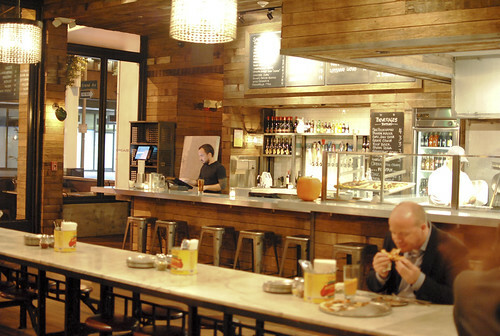 Terroni has been on my list of restaurants to try for some time now. I first tried a sampling of the restaurant at The Taste 2011, where they were making a selection of their pastas fresh on the spot. 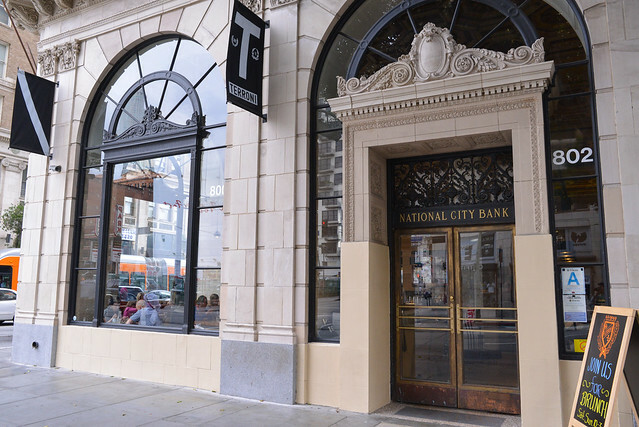 The Toronto-based chain has had a location opened on Beverly in mid-city for a number of years, but recently opened up in a huge space downtown. My visit to Terroni was unplanned. Initially, we were planning to visit new ‘Chinese gastropub’ Peking Tavern but found it closed for a private party. Terroni shares the same building so it was an easy choice for an alternative stop. 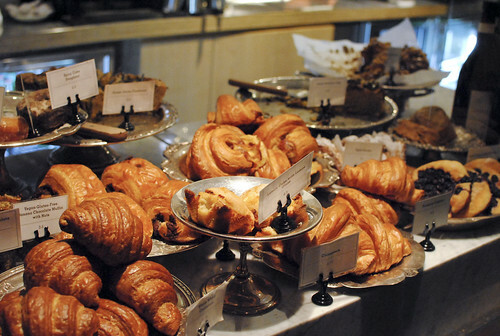 Given it was noon on a weekend, Terroni was serving up their brunch menu. I don’t like eating brunch as my first visit to a restaurant, but they still offered their extensive full menu (a long list of appetizers, salads, pastas and pizzas). After running 13.1 miles in the OC half marathon, a number of options were debated in which to offset our caloric deficit. Oxtail pho and Brodard’s famous nem nuong spring rolls were leading contenders, as well as dumplings and other comforting Asian soup noodles. 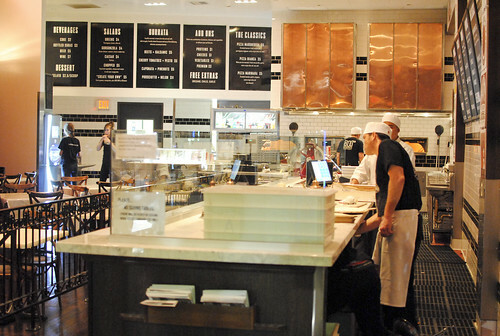 However, in the end, Newport Beach’s own location of one of LA’s favorite pizzerias was the choice. 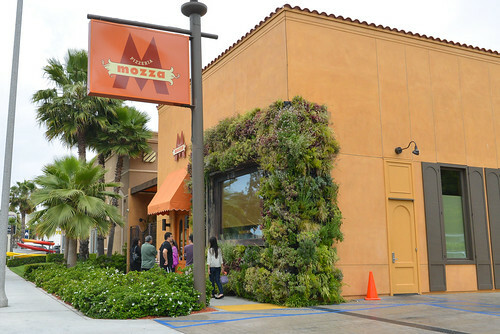 Much has been written about Pizzeria Mozza and its original location on Melrose & Highland in LA continues to be very popular. Opened in 2011, it’s actually the third location of the mini-chain, with the second being in Singapore. Decor and menu are both very similar to the original, with the latter featuring a bunch of antipasti, a handful of meat, salad and panini dishes, and about a dozen pizzas. 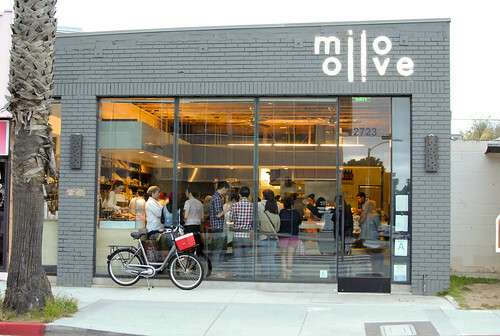 Milo & Olive is the newest restaurant (opened in November) in Josh Loeb and Zoe Nathan’s quickly expanding empire in Santa Monica that already includes Sweet Rose, Rustic Canyon and Huckleberry. 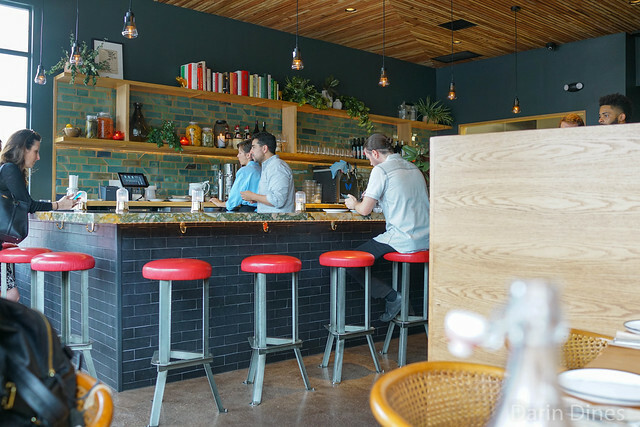 I’ve been to both Sweet Rose and Rustic Canyon and enjoyed both so this place has been on my radar, but I never had just the right impetus to make the drive over to the westside. That is, until a friend of mine clued me in to Walter Manzke being in the kitchen! Casual readers may know I’m a huge fan of his work, and I quickly picked a date to come out and check this place out. 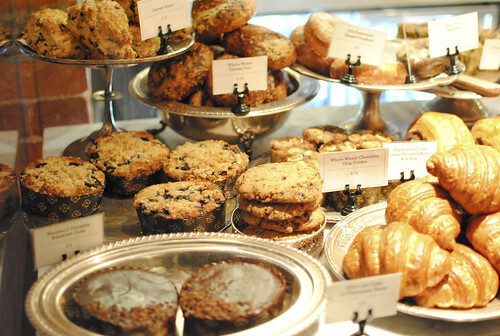 Milo & Olive is categorized as sort of a bakery/pizzeria, but its more than a pizza parlor, offering a host of baked goods (displayed in the front; I’m guessing these are similar to ones offered at Huckleberry) and a bunch of small plates from veggies & grains to meat & fish. When discussing his stint here, Manzke’s temporary role seems to be as a chef consultant rather than, say, an Executive Chef. He’s definitely not here to completely overhaul the menu with his imprint. It’s a pretty small place with two communal tables seating 6-8 each and a kitchen counter seating about 8 more. No wonder the lines are so long; we waited about 45 mins on a chilly Tuesday evening. The artichokes were served warm, lightly dressed with a vinaigrette balanced by some sweet raisins. Some goat cheese added a subtle funk to the dish, but not in an overpowering way. 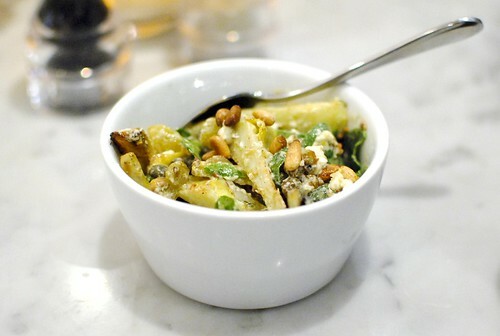 Pine nuts added a nutty crunch. The prawns came out sans shell, cooked to what I thought was a medium/medium-well like temperature. A bit on the firm side, I like my prawns a little more springy and succulent. 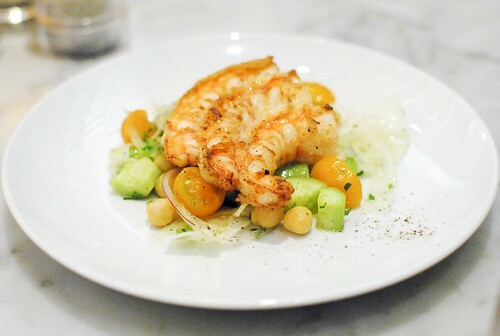 The accompanying salad of creamy garbanzo beans, juicy tomatoes and crisp cucumber was a fresh and tasty side that I thought went well with the shrimp. 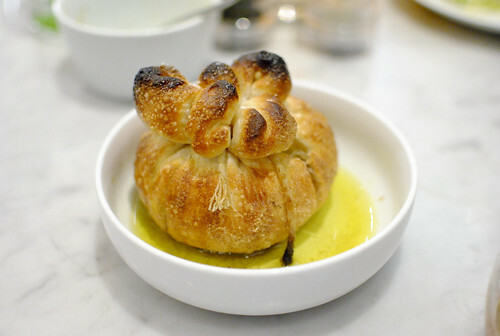 This was probably the most memorable dish of the evening, a warm doughy ‘purse’ filled with garlic. The garlic was cooked down to a very soft texture and was sweet, far from the bitter bite of raw garlic. The dough itself was crispy on the outside and pillowy soft and yielding on the inside. With a dash of salt and olive oil, these were some great bites. Of course, we sampled a couple of pizzas too. 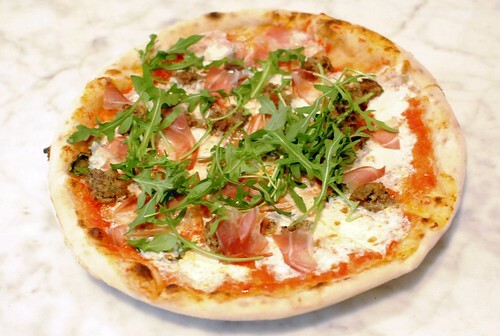 The pizzas resembled Mozza’s in size and style – I thought they were pretty well made. 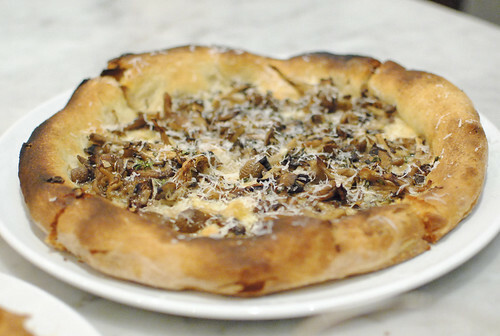 The mushroom pizza was expectantly earthy with the clean flavors of the mushrooms, cheese and a hint of thyme. I really enjoyed the pork belly sausage; the sausage itself was delicious balanced by some greens and a really tasty tomato sauce. It’s so hard to compare pizzas across the city since everyone has a different idea of the perfect pie, but that pork belly sausage pizza was one of my recent favorites. In addition to the baked goods in front, there were a few desserts offered. We had room for two of them. The lemon meringue was simple but well done, with a fine balance between the light and creamy lemon curd and sweet whipped meringue. 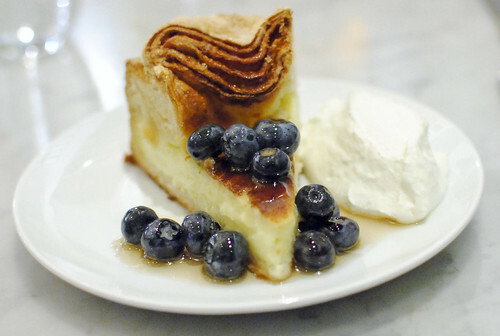 I liked this dessert better with it’s rich, subtly sweet custard in a flaky, sweetened crust. Blueberries were a nice topping too. Manzke came out to chat with us at the end of the meal to share some of his thoughts on the LA food scene and his upcoming restaurant République (it will take some time). This was my first time spending any sort of quality time with the chef, and I was definitely excited to do so. Also at the end of the meal, we were each gifted bags of goodies to take home; a loaf of bread and some type of pasty. 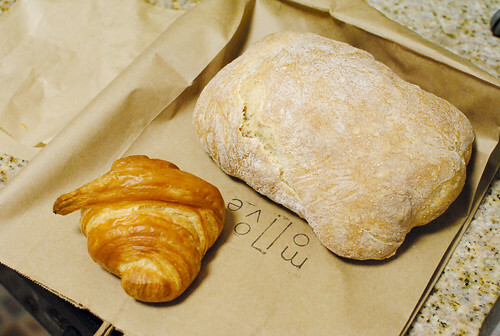 I got a loaf of ciabatta and a croissant. Score! It was the end of night and they were presumably clearing out the day’s inventory, but I thought it was a nice touch (per Yelp, it’s a somewhat common occurrence – so go late!). Even the next morning (or days, in the case of the ciabatta), they were pretty delicious especially when reheated lightly in the oven. Milo & Olive was pretty good. My favorite items tended to be those involving dough, including the garlic knot, pizzas and dessert/pastries (I’m definitely gonna have to check out Huckleberry soon). The two small plates we tried were good but just missing that extra ingredient to make them pop. If this restaurant was in my neighborhood, I’d definitely be back soon. Given it’s across town from me, I’d have to think about it a little – there are so many other places I still want to visit for the first time. 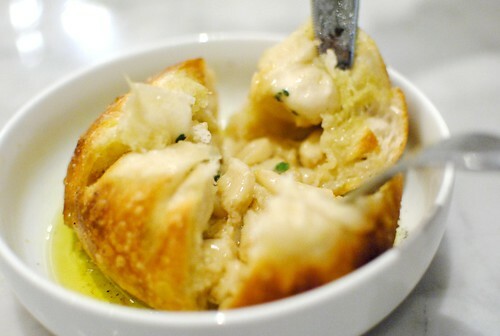 But who knows, that garlic knot may be calling my name sooner than I think. 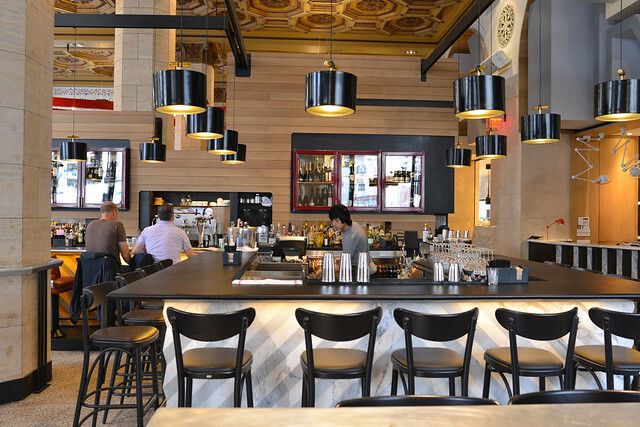 800 Degrees opened early last month, a new concept via a partnership led by Umami Burger’s Adam Fleischman. 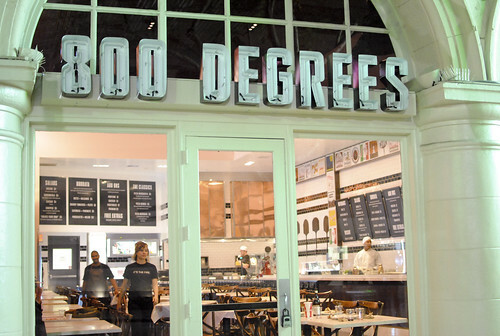 After a dinner at LudoBites, somehow the topic of 800 Degrees came up. It was open late (until 2am everyday), was nearby, and would be relatively quick. We were sold. 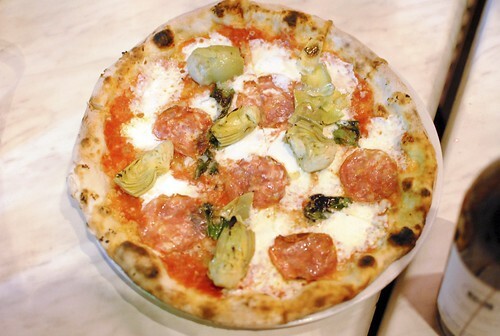 There are plenty of pizza options in LA, but this one’s a little bit different. It’s essentially fast-food pizza, but customizable and made-to-order with fresh ingredients; I think comparisons to Chipotle are fitting. 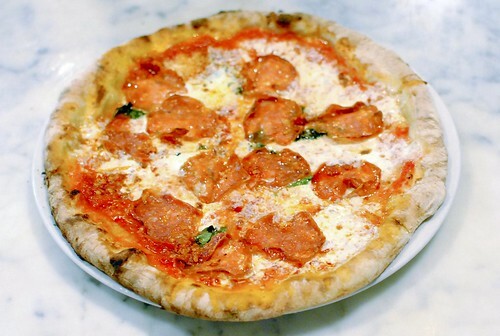 It reaches a medium ground between the quickness of a Domino’s or Pizza Hut and the higher end pizzas at something like Mozza. 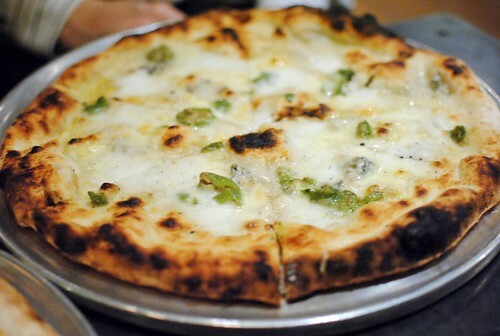 Kind of like Pitfire Pizza, but even cheaper and more customizable. 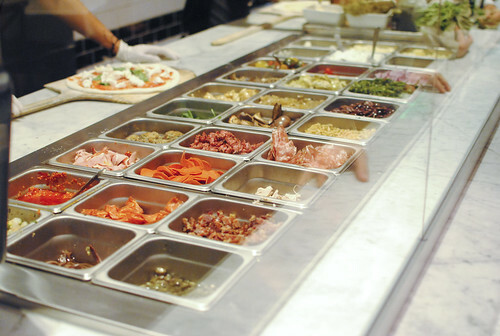 The pizza creation process is assembly line, with one’s preferences taken throughout. 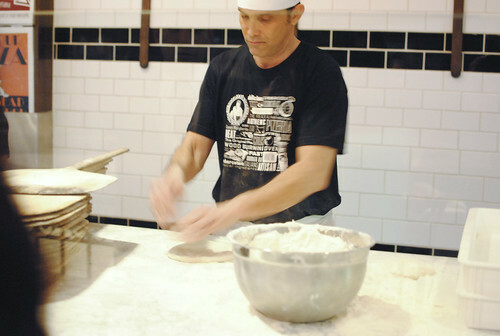 Three base pies are available (margherita, bianca, marinara at $5-6) at the first station, where fresh dough is rolled out. Next a whole host of toppings are available, completely optional, most $1 each. Don’t want toppings? Fine. 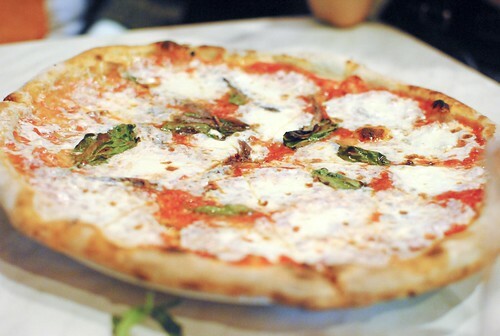 The Pizza Margherita is $6. 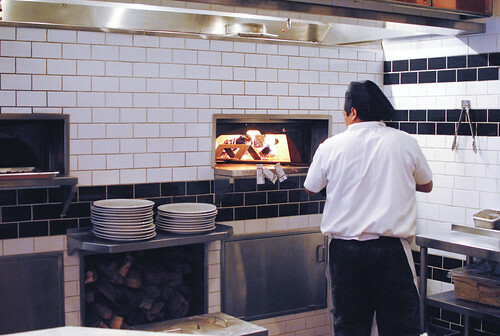 Once ready, the pizza is baked in the wood-burning oven for just a minute or two, all while the customer watches. Pretty cool. 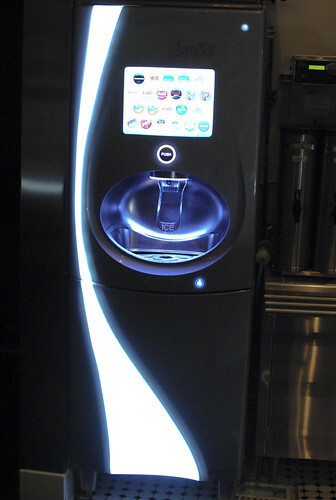 Also cool is this futuristic looking soda machine – various “base” sodas and flavored syrups are available. It’s all about customization here, apparently. Between our group, we ordered up a variety of pies. How were the pizzas? Pretty good actually. The dough was soft, had some nice char, and had a nice chew. I thought the toppings were good, but none were particularly memorable. Overall, it was good pizza at a great price, fast. Very satisfying. I’m a big fan of the model, and gauging other reviews, it seems like the rest of the city is too. I fully expect expansion soon and potentially on a large scale…not unlike Umami Burger. There aren’t many good options for pizza downtown. 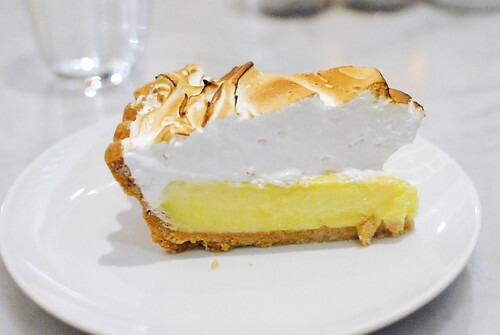 Bottega Louie serves a good, though somewhat inconsistent, pie. Drago Centro can make one, but it’s definitely not a focal point. And chains like Pitfire and California Pizza Kitchen are around. 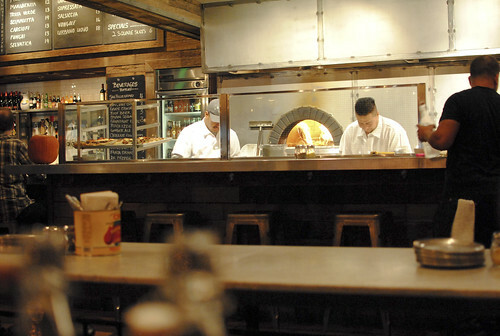 So, whenever a new pizza place opens up, it has the potential to fill a sizable void. 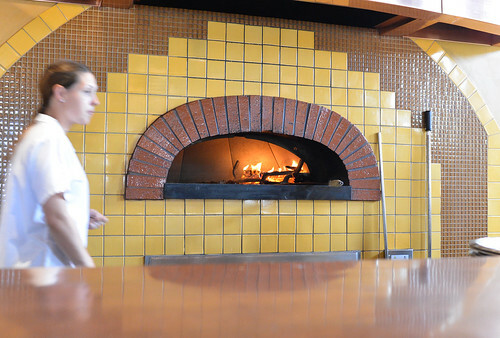 Urbano Pizza Bar opened in June from the same owners of the next-door Library Bar, CoffeeBar and Spring Street Bar. Given that it’s close to the office, I’ve been a few times for lunch. 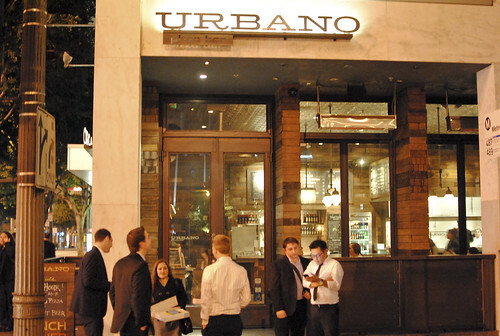 Looking for a last-minute dinner choice with 7 co-workers, someone mentioned Urbano. Given there was recently a BlackboardEats promotion, this was perfect timing. 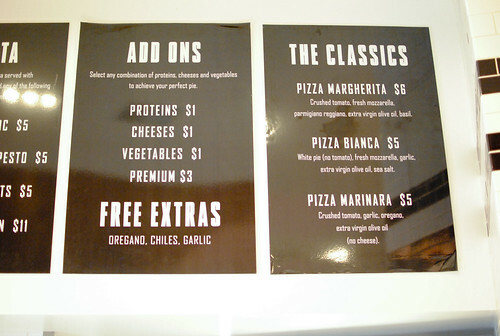 The menu is made up of a large number small plates (almost all under $10) and about 10 pizza options ($12-18). A small list of wines and craft beers are also available. This was the lone appetizer ordered in a sea of pizzas and it was a good one. 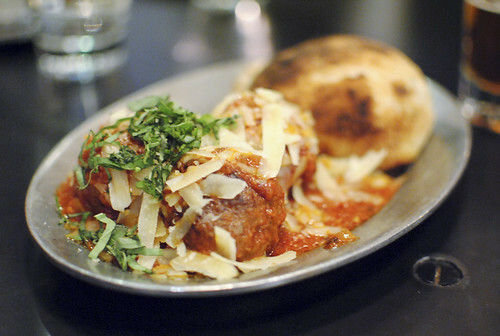 The meatball was good; dense, with a meaty and herbal flavor…as expected. What separated this dish was the warm pizza bread. Fresh out of the oven, it was soft, slightly chewy and was the perfect bread for a meatball sandwich. I foresee a lunch based on this dish in the near future. We had a vegan at the table, so the one pictured had no cheese. 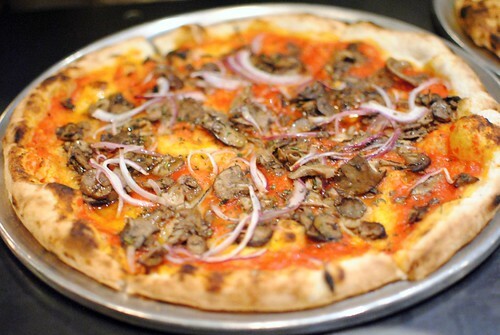 I’ve had this pizza (with cheese) at a previous lunch; the mushrooms added an in-your-face, strong earthy flavor to the pie. Definitely good for the mushroom-lover. Of the pizzas we ordered, this one sounded like the most boring and it didn’t prove to me otherwise. It was fine but I didn’t think it had much depth. In previous visits, this has been my favorite. 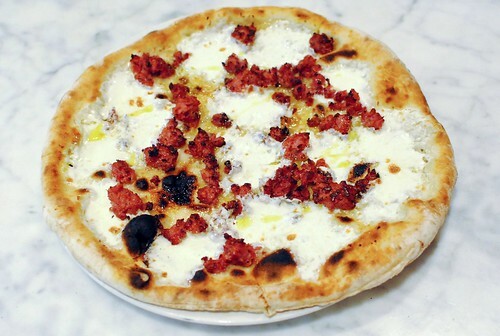 The sopressata and chili are balanced very well, lending both meaty and spicy flavor profiles. Some scallions provided a fresh bite. Good sausage. For some reason, I thought the caramelized onions were a little bit too sweet though. This may have been my favorite of the pizzas served that night. 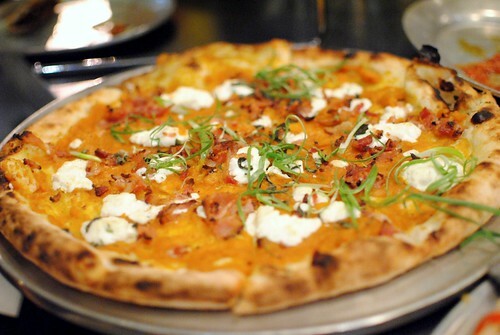 Perfect for the season, the sweet, creamy pumpkin worked well in tandem with the smoky bacon. The goat cheese was not too pungent, adding an extra richness and creaminess to the pie. Very good. 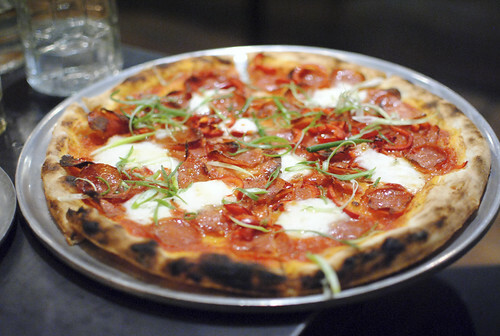 I don’t think Urbano will make any “best-of-LA” pizza lists, but it’s a very viable option downtown. 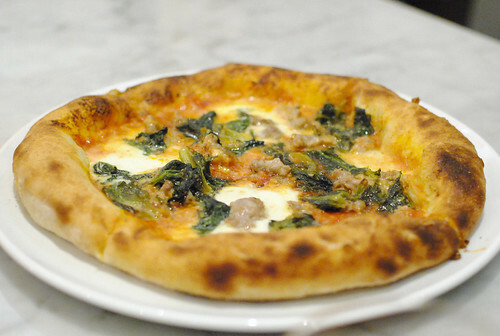 Is the pizza better than Bottega Louie? Hmm…maybe. I’m not sure, but they’re close. The pizzas at Urbano are a little more creative, topping-wise; but I think some were better balanced, flavor-wise, than others. The crust has been crispy yet chewy, and pretty consistent across visits and pies.